Not just for bathrooms anymore! I’ve read many previous Bathroom Readers in paperback format in, of course, the bathroom. This is my first Kindle version of the long-running series. It opens up the reading possibilities substantially. The varying lengths make this a good choice for grocery store checkout lines, doctor’s waiting rooms and during a particularly boring college lecture hall. However, if you’re a risk-taker, you can also try traffic signals (while red of course), during boring work meetings (pretending it is a text from an important customer), or while waiting for your tow truck to arrive after being rear-ended at a traffic signal that turned green while reading a story from this book that was obviously too long. Who turned the spit that roasted the meat in medieval kitchens? Specially trained dogs [without teeth or with great self-control I guess]. There are anecdotes for every taste: funny, thoughtful, intelligent and heartwarming. An example of the last is the story of a devoted husband who is trying to help his blind and depressed wife see the world without leaving her backyard. Strangely, there are also recipes. Hopefully, no one is cooking while in the bathroom! 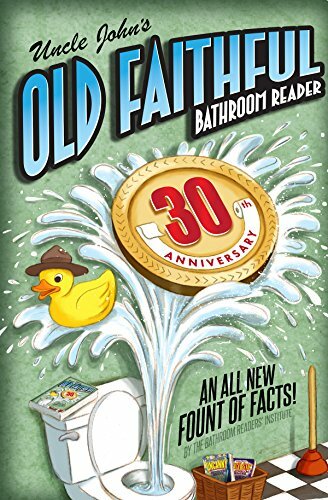 Uncle John’s Old Faithful Bathroom Reader is a great read for everyone who wants to fill a few moments with a fun fact or an interesting true story. 5 stars! Thanks to the publisher, Portable Press, and netgalley for an advanced review copy.